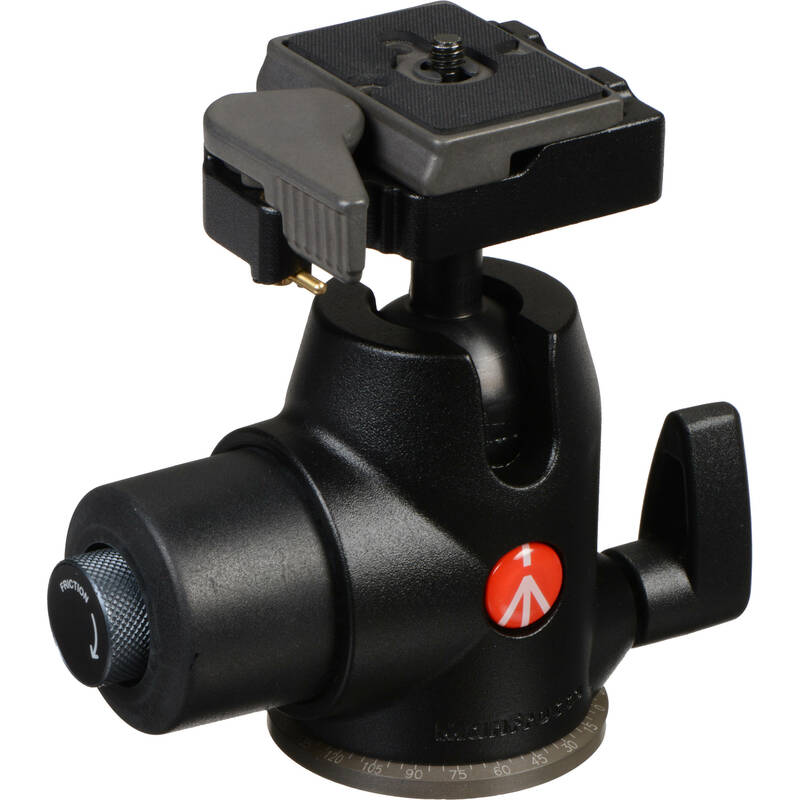 This 468MG Hydrostatic Ball Head from Manfrotto includes an integrated RC2 quick release cam lock and a 200PL-14 Quick Release Plate. RC2 compatible quick release plates such as the 200PL-14 can be removed from the head by pulling the cam lock's spring-loaded lever, which also allows the plate to be instantly reattached. The cam lock also features a safety catch to prevent the 200PL-14, or another compatible quick release plate from accidentally disconnecting. The 468MG Hydrostatic Ball Head with 200PL-14 Quick Release Plate features a ball-and-socket joint that utilizes pressurized fluid, which helps to provide a 22.1 lb load capacity and an easy-to-tighten locking mechanism. By loosening the 468MG Hydrostatic Ball Head's primary locking knob, the ball-and-socket joint can be quickly swiveled, angled, fully tilted, or returned to its upright position. An additional knob set within that locking knob can be rotated to apply tension control to the ball-and-socket joint's movements. Along the opposite side of the ball head, a secondary locking knob controls the ability to rotate the head 360°. Box Dimensions (LxWxH) 7.874 x 5.118 x 4.095"
468MG Hydrostatic Ball Head with 200PL-14 Quick Release Plate is rated 4.8 out of 5 by 127. Rated 3 out of 5 by Nick from Beware of the COLD Great Ballhead but it cant handle the cold. The Hydrostatic system failed, i.e. froze/burst, while on a trip to China. Manfrotto was kind enough to inform me, after the fact, that it can not be subjected to a temp below -10 degree Fahrenheit. China and many parts of the US get colder than -10F during the winter. It gets even colder when checked on an airline. Manfrotto replaced the Ballhead with a 3-Way Head, model 229, and I'm purchasing an Arca-Swiss Monoball Z1 for my lightweight travel Ballhead. Rated 5 out of 5 by Anonymous from Fantastic Head Purchased a 498RC2 Midi Ball Head at first thinking that there was not much difference. However, the difference was apparent once a camera and lens were attached. This ball head is really smooth and works well with heavy equipment. It is quite easy to use and well made as well. Thought that the head would not hold or work well with a D2X and 300mm 2.8 combo. However, it worked really well. The ball locking mechanism holds the heavy lens and camera combo tightly. The tension control is really fantastic and adjusts the movement of the ball according to user setting. Hoping to try it out with a 400mm 2.8. Good product, highly recommended. Rated 5 out of 5 by campfire kid from Silky smooth I use this primarily with a canon 100mm macro lens, a 24-70mm and a 70-300mm zoom. The thing that is amazing about this compared with my old Manfrotto head is how smooth it moves and what little effort it takes to lock the camera into place. A gentle quarter turn and the camera is locked! You can adjust the tension so that your camera doesn't flop around when you are moving it which makes it very nice for when you are trying to move it very slightly for macro photography. The only giant drawback is the price. But if you can afford it you won't be disappointed. This is the ferrari of tripod heads. Rated 5 out of 5 by Mel from Highly Recommended I've recommended this ball head to all my students for the past several years. Finally, I purchased one for my professional use.The smooth action, ability to set the friction to fit one's hand strength, and speed in composing the shot make this the ball head to buy - in my opinion.It is durable enough to support my 500mm lens/camera combination and definitely supports any of my students' equipment.I've wanted to buy this ball head since I've been recommending it. 20+ students have followed my advice and purchased them. Now I can lead by example. Rated 5 out of 5 by PureBlue from Rock solid ball head. I recently purchased the Manfrotto 327RC2 and found that it wasn't strong enough to support my Canon 7D Mk II with canon 100-400L IS ii lens attached. Late at night after a beer or two I splurged on the 468MGRC2. The next morning I had buyers remorse for spending that much money and I intended to return it. After receiving the ball head I found that I loved the build quality and it held like a rock. I changed my mind and decided to keep it. It's the best ball head I ever owned. It's easy to use w/o too much force to lock it down. I highly recommend this head. My only disappointment is that it doesn't have a bubble level which is not a deal breaker being that my Manfrotto tripod legs have one. Rated 5 out of 5 by The McKenzie Kid from Easy to Work With I started with a Manfrotto 055CXPRO3 tripod, I added the Manfrotto 204SPK3, retractable spiked feet. To complete my tripod I added this ballhead. The friction adjustment makes it very easy to make fine adjustments and the head locks quickly and solidly with minimal effort. I can live with this set up for years to come. The total package is around 5 lbs. and provides a solid base for my photography. This head weighs about a half pound more than the lightest quality heads, but the ease of operation more than makes up for the extra weight in my book. I do not have any exceptionally heavy equipment so I am perfectly happy with the RC2 plate system. It locks securely with minimal play and I appreciate the double safety lock that prevents accidental release. Rated 5 out of 5 by Anonymous from Great Ball Head-Worth Every Penny At first I was hesitant to pay this much for a ball head, but within 1 minute of attaching my 30D w/300 F4 IS to it, I was convinced it was worth every penny. My previous ball head, the 486RC2 was so hard to lock down, almost got tendonitis. This hydrostatic ball head requires just a small turn, without breaking my fingers. Once it's locked, IT'S LOCKED. I no longer feel like I'm going to strip out the locking mechanism. The additional panning control is nice also since my 486rc2 didn't have that. Now I know what they mean when they say you get what you pay for! Rated 5 out of 5 by Anonymous from Excellent ball head This is an excellent product. The action is very smooth, the friction and locking knob mechanisms are very easy to use, and it locks solidly with a D700 w/grip and 70-200 f/2.8 on it. I have compared it against the 322RC2 and the newer 327RC2 and this is my favorite. The panorama feature is nice, but there is one small problem with it. If the panorama lock lever (small lever at bottom) is in the unlocked position, the camera will tilt *very* slightly upon tightening the main hydraulic lock. To get around it you just reframe and keep the pano lock lever in the unlocked position as you shoot your sequence. Not a big deal, but it's worth mentioning. For me the flexibility of a ballhead was paramount, and the panorama feature secondary. I gave it five stars because it met my needs perfectly. Can someone please tell me the diameter of the base on the Manfrotto 468MGRC2 Hydrostatic Ball Head? Is the ball sphere diameter really 2 inches? It looks much smaller diameter than the base in the picture. I am wondering if the description is a misprint and really should say 2 centimeters instead. It's a little bit less than 1,5 inches.